The merging of these two technologies will produce unprecedented accuracy in locating brain electrical activity non-invasively. It is anticipated that the new technology will improve the accuracy of brain mapping of patients with epilepsy. It may also improve the diagnosis of cancer patients because the improved image contrast may facilitate the characterization of cancer tissue, says Academy Professor Risto Ilmoniemi. Whole-head MEG device that maps the human brain electrical activity. 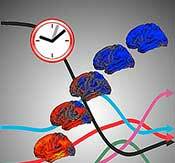 There are many advantages to this new neuroimaging method. For example, the innovative MEG-MRI device will allow for brain imaging for conditions not previously possible, such as those with metal implants. The silent and open device also reduces fear for children or those who feel “claustrophobic” in confined spaces. In the future, this development can also reduce costs as images can be obtained in one session rather than two, Ilmoniemi states. The problem with MEG is that when the technique is used separately, the image accuracy can be compromised because of the movement of the brain. Also, the image it provides may not be accurate enough for precise brain surgery. In the past, it was not possible to combine high-field MRI and MEG because their magnetic fields interfered with one another. Extremely sensitive magnetic field sensors have now been developed, so scientists can now use the new low-field MRI with a magnetic field strength of only a few hundred-thousandths of that of the high-field MRI device. Fusing these two technologies produces localization accuracy that was not possible with MRI or MEG alone. The project is coordinated by Aalto University in Finland and it includes 13 research groups from five different countries. The research project is part of the European Commission Seventh Framework Program. Material adapted from Aalto University.